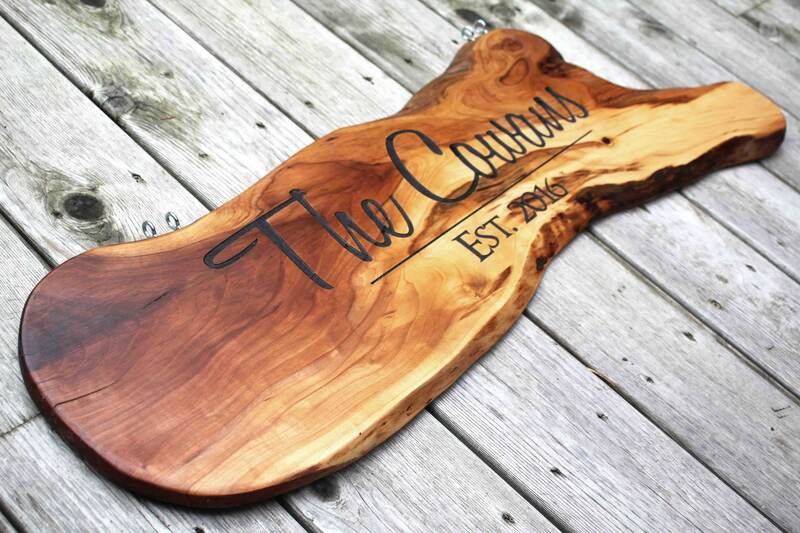 Personalized handmade rustic wooden sign with custom personalized engraving. These wooden signs are cut from mature locally grown apple trees. Each piece is carefully selected for its unique grain and shape and is hand sanded and sealed. These beautiful wood pieces have a uniquely vibrant and textured grain and there are a limited number of pieces available, especially lager pieces. The wood grain, size, and shape are different for each piece so each piece is truly unique. The size of each piece is roughly between 8-14" wide (the narrowest parts are around 8" and the widest parts are up to about 14") and you may select the approximate length. Each sign includes a personalized laser engraving. 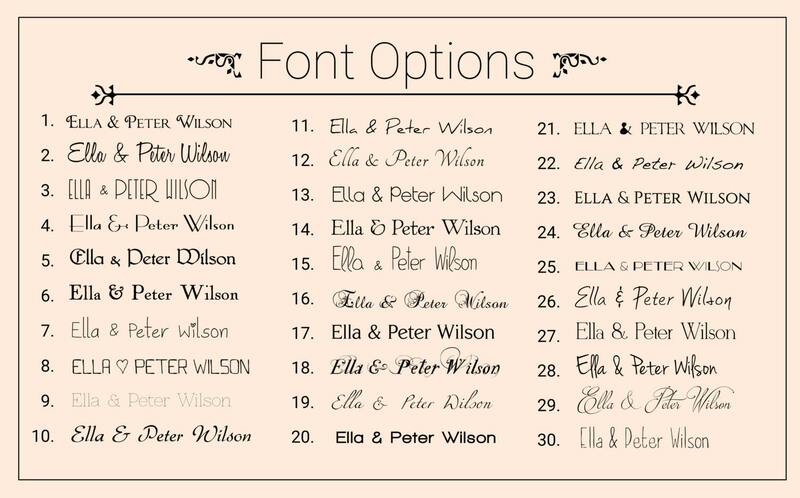 The customized engraving adds a personal touch making these pieces great for weddings, and personal space signs. Alternatively, these signs can be used as cutting boards, serving trays and center piece stands that brighten up the decor of any kitchen. Your sign will come ready to hang and can be signed with a standard fine tip or extra fine tip permanent marker. 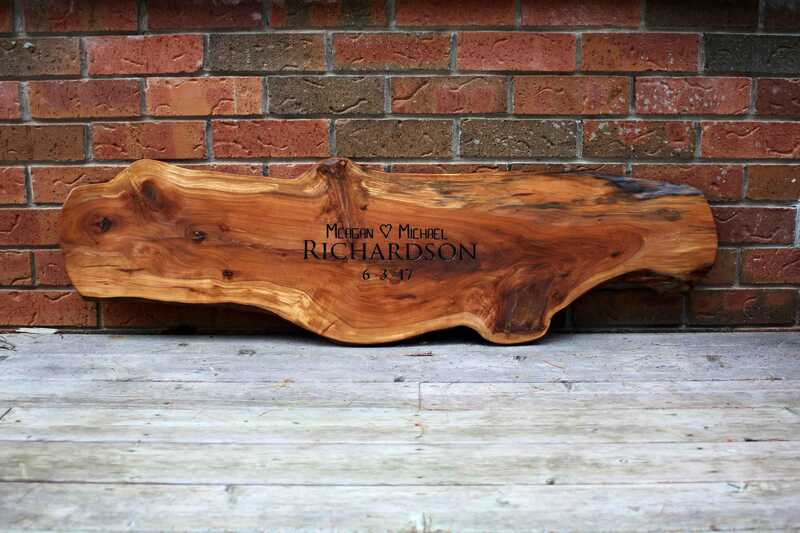 * An additional fee applies to enlarged engravings that fill out the area of the wood. This option is available on pieces up to 40" long. Send me a message to get a quote on an enlarged engraving. If you would like a cutting board rather than a sign, let me know during checkout and I will use food grade oil to seal the wood rather than a poly wood finish. These cutting boards are meant to be used and displayed and they are easily maintained by washing with warm water and mild soap, and periodically rubbing food grade oil into the surface. If you need your sign urgently, you can upgrade to a priority order with Express post shipping. Over night shipping is also an option. To make a request for an urgent order listing please contact me and I will do my best to accommodate you. I take bulk orders (2-20+), just send me a message to make arrangements. Please contact me if you need your order rushed. I will do my best to accommodate any bulk and rush requests. The word 'wisdom' appears on the back of each piece. Wisdom is my last name and my way of signing (or branding) my work. I wont include this if you don't want me to. Just send me a message asking me to exclude it. Paypal and Etsy direct are the preferred methods of payment. Currently I do not accept money orders. Everything in my shop is made in, and ship from, Canada. If you are having your item shipped outside of Canada, please be aware of the import duties that may be charged to you by your country. I will not cover these charges under any circumstances. Please complete your payment as soon as possible. I will not start the creation process on your project until payment has been processed and we have communicated details about your project. If I do not receive payment and communication within one week of the order being placed, I will cancel the order. All orders will be shipped to your Etsy Address. If you would like to arrange for delivery to another address, please contact me to make arrangements. Please provide a contact phone number with your order. This number will only be used by the courier delivering your package in case of difficulty delivering your package. The courier will only guarantee delivery times if a contact number has been provided. Since everything I create is made to order and each project can take up to three weeks to complete, creation + shipping time should be taken into consideration if you need your order by a certain date. If you require rush delivery on an item, please contact me to make arrangements (an additional fee may apply). Contact me to upgrade your shipping to Priority or Express and tracking. International shipments outside of Canada and the US are shipped with International Parcel - Surface service and can take up to 3 months to be delivered depending on the country you are in. Larger items may also incur additional shipping fees which will be noted before your project is started. If you need to receive your order quickly you can upgrade the shipping on your package by requesting a shipping upgrade. Shipments to Canada and the US are shipped with standard ground shipping and typically take 1-6 business days to arrive at their destination. Upgrades to express and overnight shipping services are available by request (additional fees apply). All customs fees will be paid by buyer. If your item is not picked up from the post office or it has an incorrect address, and it is sent back to me as a result, a second shipping fee will be charged to send your package a second time. 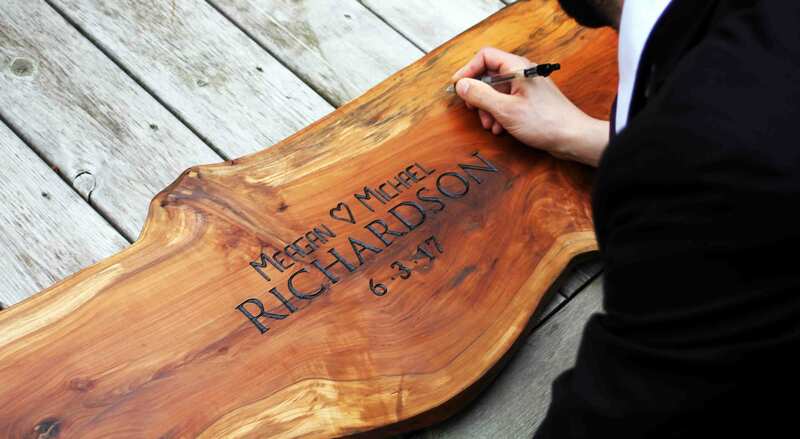 Although Rustic Engravings does ship to the US, there may be an additional charge for shipping to Alaska, Hawaii, or Puerto Rico. Also, if you live in an extremely rural area, there is a very small chance that I will not be able to ship to you or there will be an additional fee to cover the extra postage. If you live in the absolute middle of nowhere and you think shipping to your address may incur additional fees, send me a message and I will double check for you. I will not add on any fees without your permission. Since the items sold at my store are custom made to order art pieces, no returns will be accepted under any circumstances. These pieces are custom made usable artwork and I check everything before I send it out and I will only ship products that meet my high standards of quality. Since all items are made to order, wood grain will differ from the example image but I always try to select wood with an interesting grain pattern so each book will have character. Note that creative liberties are taken in the creation of each piece. The coloring and texture of your piece will vary from the original listing as well as from the mockup design. When you are purchasing one of my pieces, you are ordering a unique, customized, made-to-order art piece. If your book contains screws, please note that screw color may also vary. Screws may be all silver, all black, or all brass, depending on what I have in stock. Screw color is not guaranteed but if you prefer a specific screw color please send me a message and I will try to accommodate your request. I can only refund items that are damaged during shipping if you, the recipient, open the package with the mail carrier present and initiate a damage claim through the mail carrier. I can issue a refund once that claim has been resolved. Please be aware of your country's import laws. Rustic Engravings will not issue a refund for any package that is held at the boarder due to import restrictions. I am happy to work with you to create a custom order. I can also take bulk orders. 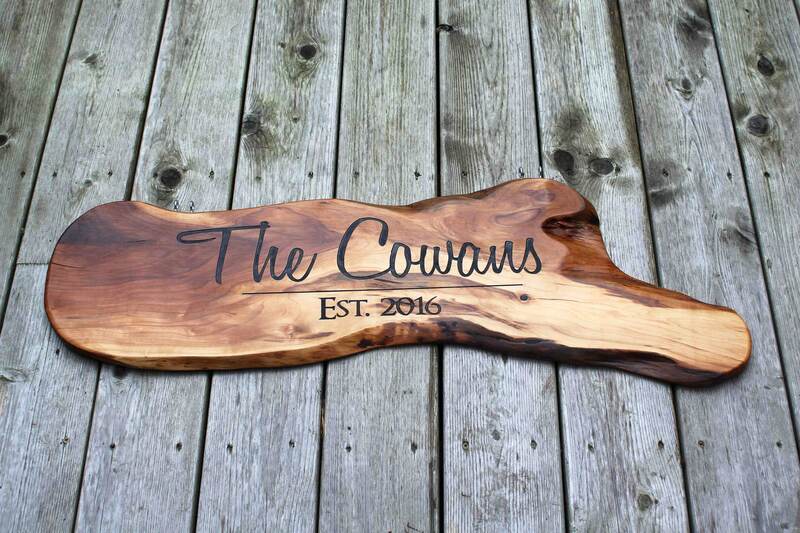 If you are having trouble sending me a message using Etsy, please send your message through rusticengravings.com or send a message directly to orders@rusticengravings.com.